I saw a picture of a cat like this many years ago. I always wanted to make one for the door. I started him 2 years ago and he ended up at the bottom of the pile of hooking. I am trying to get some of these old projects finished and it just took an hour or so to finish him. He will guard the door till Halloween is done. My Grandmother was great at crocheting. A hobby which my Mother never took up. SHe made everyone in the family crochet tablecloths. They were beautiful. SHe did a lot of other crochet things too. I have a lot of my Mom Mom Morrison and my Grandma Utleys hand work. I never met my Grandma Utley but I have many of her quilts and quilt tops which I am slowly finishing. My Mom Mom taught me how to crochet and I still have the first rug I made with Aunt Lydia’s rug yarn. 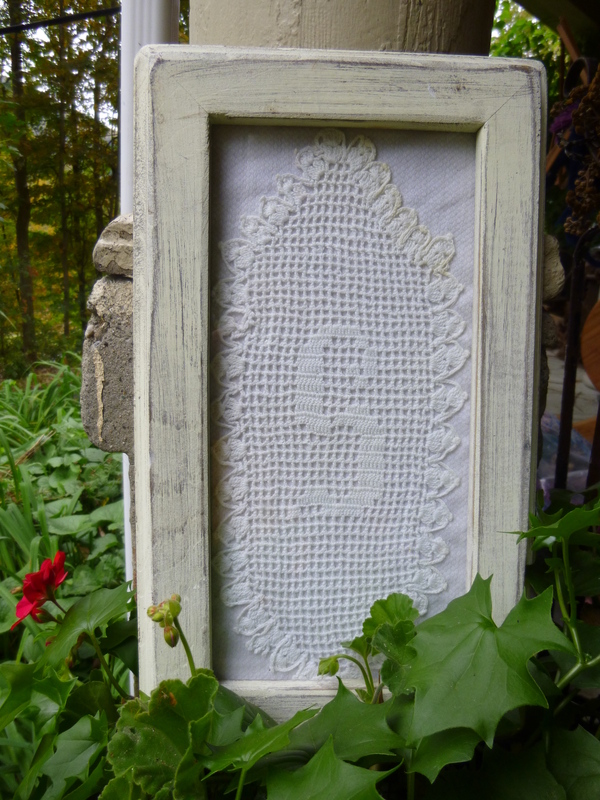 These are things that should be handed down in families but what does one do with doilies now days. This is a perfect solution for those little pieces that seem to get lost. This one in particular kept showing up and disappearing again, finally this time when Icame across it I decided it was time to do something about it and found this perfect frame. I am going to get some of the other pieces out of their storage box and pick ones that I want to do the same thing with. That way I can always be on the look out for the perfect frame. 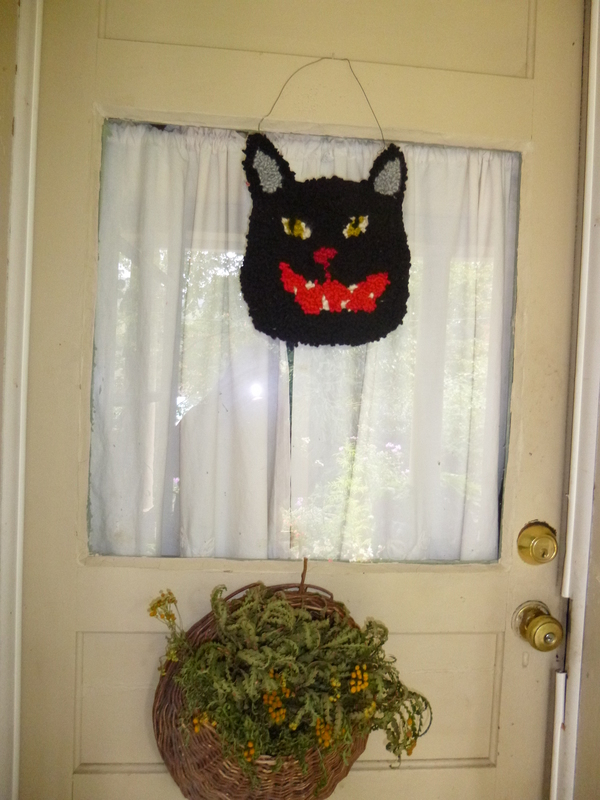 My Dad’s sister, Delia was also very talented in the needlework department and I have several of her things also. Even though I have never met her I feel close to her. Ernest seems to be on a slow road back to himself. He certainly is sick of me poking and prodding every time he turns around. He goes to his vet on Friday. I have many questions about kidney disease now and will do more research on the internet before I go. THE GARDEN I was so lucky with the Morning GLories, I have so many colors, from light pink to deep purple and they have knocked down my bed post. 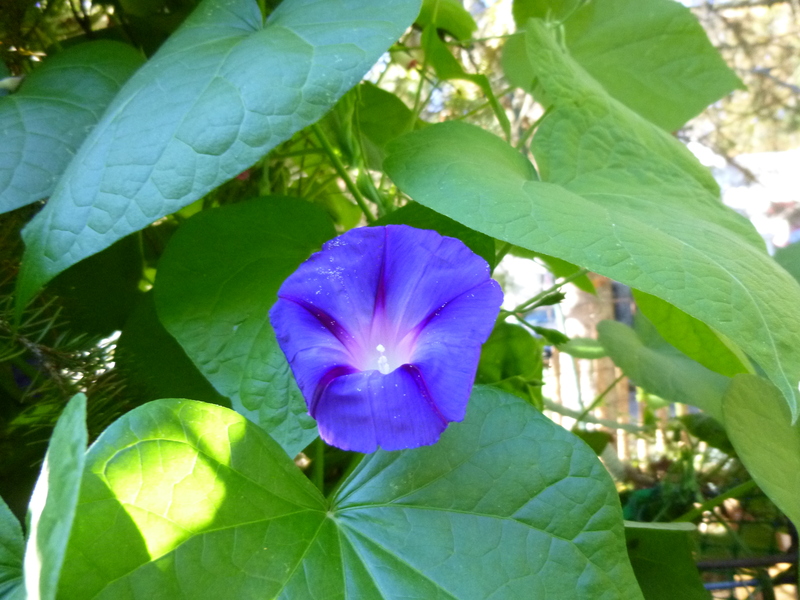 Hope you have a happy day and many thanks for reading my blog. 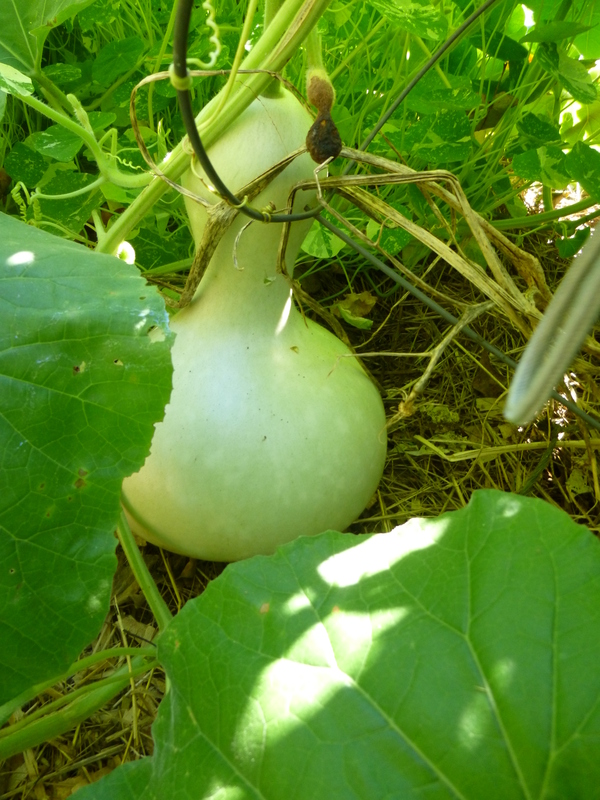 The bottle neck gourds are still coming along. Today I found 6-7 smallish ones and this one huge one. I plan to use the small ones in a garland. My son and I have been trying to give Ernest fluids. I tried with no success and so did my son. So today I took him yet again to his vets, Brookside Animal Hospital and the gals there showed me an easy way to do it. He is a laid back kitty and he was excellent . They gave him some treats while it was happening and it only took a few minutes. I actually put the needle in and now I think I can do it with ease to him and myself. He is doing a little better, he was a very sick boy and his recovery will take a little time. 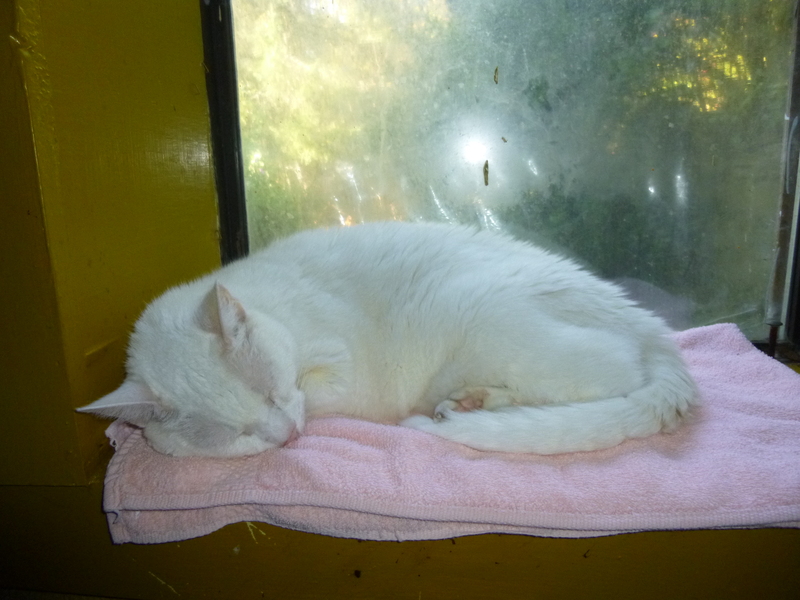 He does have kidney disease and most cats his age have it and still live long lives. SURPRISE, I am getting at least one new sheep this fall. I bought some beautiful wool in the early summer from Barbara Goodchild who raises beautiful sheep. I needed white curly wool to supply CAMP WOOL in MAine and supply myself with wool for people to use in hooking and felting. Clouds and Santa’s beards is what it’s mostly used for. The two sheep she showed me were Mother and Daughter. Two sheep would be all my barn could handle. That would be 6 sheep in all and I have had 6 sheep and the llama in the barn. The next thought would be the hay. They are not out on pasture to speak of and would need hay all year round. I will be picking one or two of them up after the New York show in October. If I am able to purchase the property in back of me that would give me a opportunity to make some pasture for them and give me next years firewood. 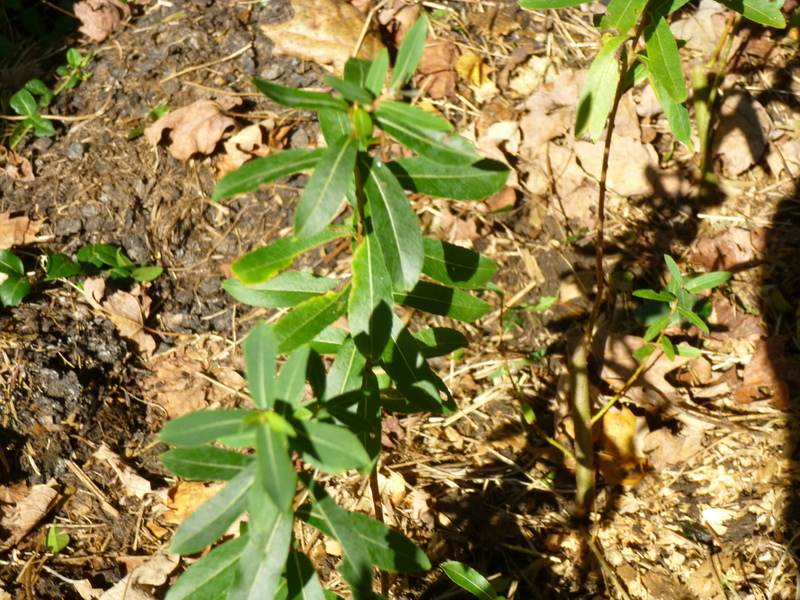 Today I started weeding the willow I planted last spring. I planted 32 twigs and it looks like they all took. They need quite a bit of weeding their first year and I did mulch them and will again after it’s all complete. The colors will range from greens to reds and oranges, purples and browns. I am hoping to have enough to make a few baskets next year. My plan is to incorporate baskets from the farm in my business. 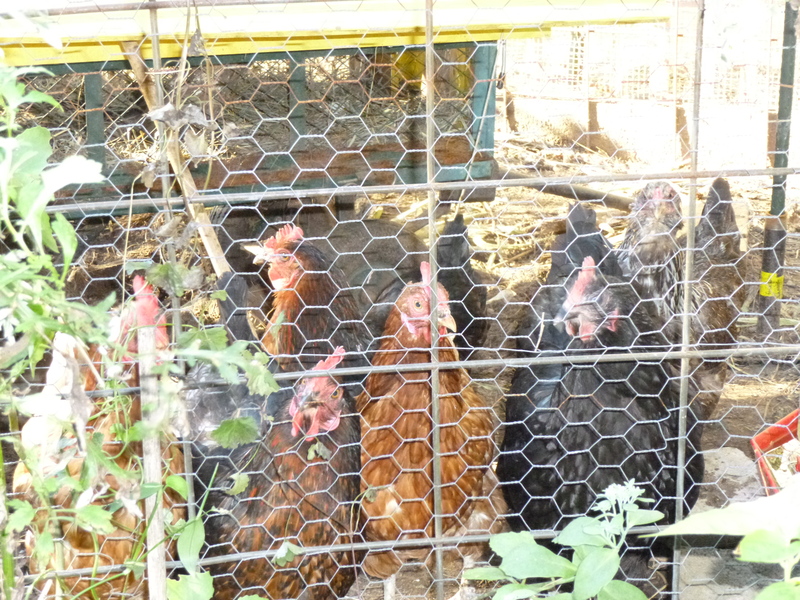 The ladies are all hoping for some tidbit at the end of the day. Yesterdays bread came out terrible. It did not mix well so the chickenS will enjoy it this morning. In looking at the recipe the ratio of liquids to flour wasn’t right. I decided to use my favorite bread recipe and make it by hand today. I have used this recipe for almost 30 years. 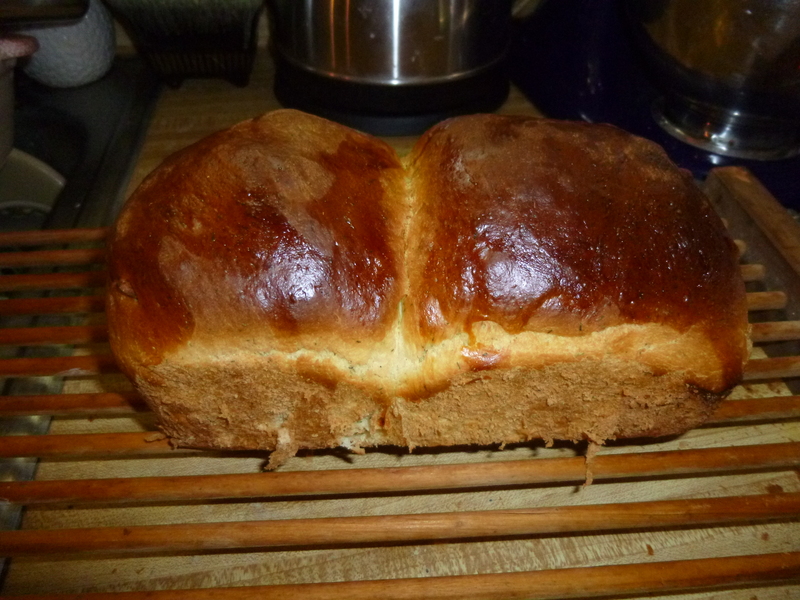 WHen I lived in Belchertown I made home-made bread almost every week. So today I added a few new ingredients to the recipe didn’t add the poppy seeds on top and we will see. PLACE SUGAR, BUTTER AND SALT, GARLIC AND DILL IN A LARGE MIXING BOWL. ADD HOT MILK AND STIR TO SOFTEN BUTTER, COOL, THEN ADD IN THE EGGS AND BEAT TILL WELL MIXED. PUT YEAST IN A SMALL BOWL AND ADD WARM WATER. LET SIT FOR A FEW MINUTES. ADD THE YEAST TO THE BUTTER MIX AND STIR THEN ADD 4 CUPS OF FLOUR, BEAT TILL SMOOTH. ADD ENOUGH OF THE REMAINING FLOUR TO MAKE A SOFT DOUGH. TURN OUT ONTO A FLOURED SURFACE AND KNEAD TILL SMOOTH 8-10 MINUTES. PLACE IN A GREASED BOWL ,IN A WARM PLACE FOR 1-1/4 HOURS TO RISE TILL DOUBLE IN SIZE. LET REST 10 MINUTES. CUT DOUGH IN HALF AND GREASE 2 LOAF PANS. 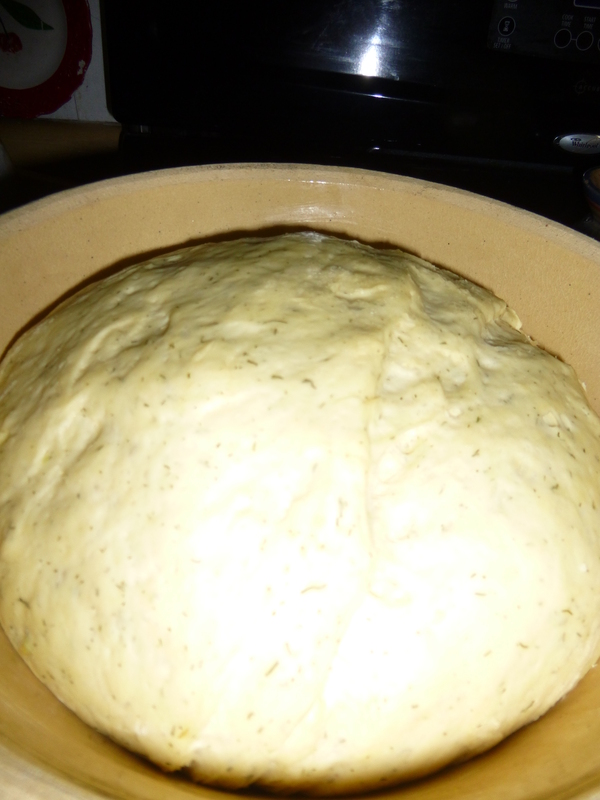 PLACE THE DOUGH IN THE PANS AND LET RISE TILL DOUBLE AGAIN APPROXIMATELY 45 MINUTES. PREHEAT OVEN TO 400. BRUSH LIGHTLY THE BEATEN EGGS WHITES ON TOP OF EACH LOAF. PLACE IN OVEN AND BAKE FOR APPROXIMATELY 25 MINUTES. THIS RECIPE WAS ORIGINALLY CALLED POPPY SEED BREAD AND I BRAIDED THE BREAD AND PUT THEM ON COOKIE SHEETS TO RISE THE SECOND TIME . I ADDED POPPPY SEEDS AFTER PUTTING ON THE EGG WHITES. 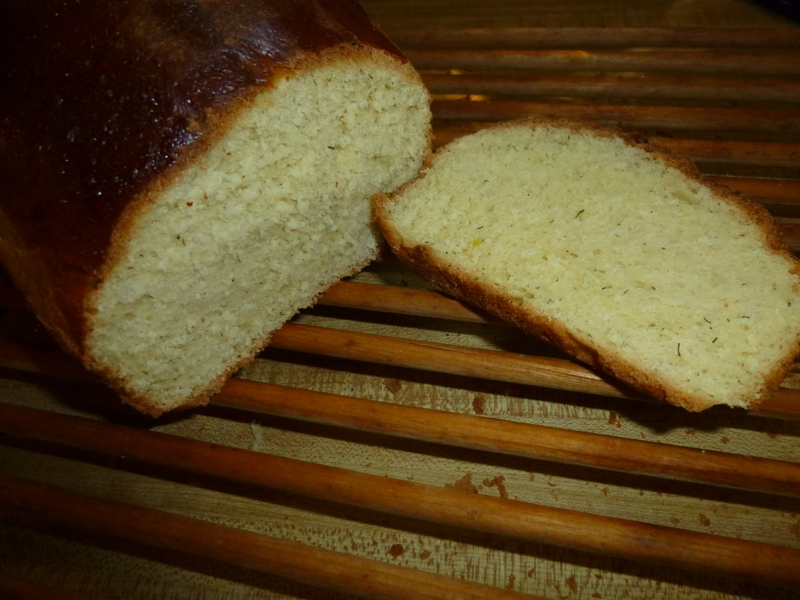 A VERY GOOD BREAD TO SERVE WITH SPAGHETTI. Thanks for reading my blog and I hope you have a wonderful day. Ernest is doing better today.